By Rean in Blogging. Updated on November 10, 2017 . As owners and strategist of a website, we are always looking for more ways to increase the traffic and number of visitors to our website. While most of the techniques – social network promotions, advertising, word of mouth, etc – get you traffic from the outside, there are a few things you can do from the inside to increase your website’s overall traffic. Increasing pageviews from inside the site is cheap, but requires a bit of a technique. When a visitor lands on one of your pages, find ways to encourage them to read the next page, and another page, and another and so on. One of the most common ways to do this is by using social toolbars. The "Related link section" is yet another common practice used to encourage visitors to stay longer on our website by promoting and recommending them to read another article similar to what they are currently reading. If you are a WordPress user, you know that this can be done easily with plugins, or without plugin. This method is a crowd favorite, and we now see many emerging third party services providing similar services – good news for non-Wordpress sites. In today’s post we take a detailed look into three of the most popular third-party related link services on the Internet. Outbrain‘s widget is pretty customizable; you can have it displaying links within your website (to increase pageviews), or from external yet still relevant websites, or a diplomatic combination of both. The widget can display thumbnails, simple text, or a combination of the two. 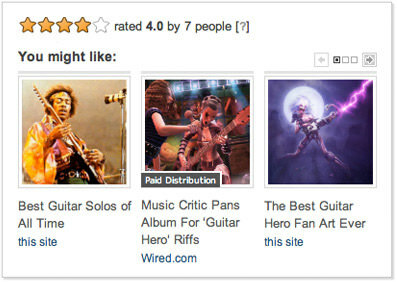 There’s also a rating feature where visitors can rate an article based on a 5-star rating scale, or thumb up an article. Customers like Slate, Huffington Post, ELLE and TMZ pay Outbrain to distribute their content. If you run a high-traffic website with high-quality content, displaying Outbrain’s paid distributions or sponsored posts may open up an additional revenue stream for you! To understand more about Outbrain for publishers, click here. Outbrain’s CSS guide allows you to change your related content widget’s appearance to merge with your site design. If you get stuck, ask for help in the forum or from their newly released support for mobile website. I encountered a problem, among others, with the installation. Upon signing up, a key is sent to you to input in your blog’s control panel. The "key claiming" process seems a little buggy, and you may need help from one of Outbrain’s staff for the claiming process. 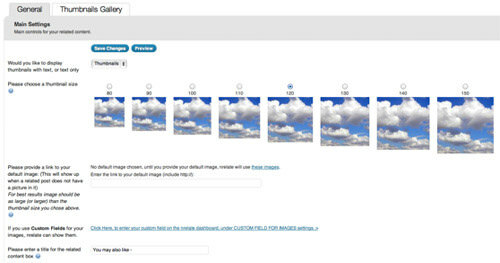 Also, you have no control over the size of the thumbnails no matter how customizable Outbrain gets. Similar to what Outbrain does, nRelate’s Related Content displays related links from your blog/website or from your blogroll. Between the two, nRelate is easier to customize as it is easier to control which links and from which blog is to be displayed. nRelate’s design is pretty responsive in a sense that it reads your website’s theme and follows it to fit the background. It supports 13 major languages, a perfect solution for non-English blogs. And according to nRelate you can get a traffic spike of somewhere between 5%-12%. That sounds like a great deal! nRelate gives users the freedom and flexibility to manipulate the widget – from how texts should appear to the sizes of the thumbnails – through the control panel. It also gives old content revived circulation, allowing them to get equal exposure as do their newer counterparts. In this, nRelate has an option to let you choose how far back you want archived posts to be recommended. nRelate also has a revenue-sharing program with its publishers/subscribers. With about 12,500 publishers, nRelate has fewer publishers than Outbrain’s 70,000. Thus, you may not want to keep your hopes up with the traffic and revenue expectations. In addition, nRelate takes two hours or more to index your website upon installation. Recommended links will only start showing up after that. LinkWithin is relatively new. It provides services similar to nRelate and Outbrain but currently it only shows related links from within the website. Other functions will probably come in at later stages. Its selling point is in its simplicity: it is simple to set up, and simple to use. You don’t even have to sign up for anything in order to get started. One of the things I really like about LinkWithin is its ability to deal with non-image content intelligently. Upon detecting an article that doesn’t have a thumbnail, rather than displaying a blank box to fill the gap, it displays texts with links instead of a dummy image which usually looks like an error image. LinkWithin is light and fast. Its design is simple, nothing fancy, so it blends well with most layouts. LinkWithin currently does not provide a revenue-sharing option which may seem like a disadvantage but without ads, it makes your related links more relevant, and visitors are less likely to be irked by ads and compelled to leave your site. LinkWithin lacks of advanced analytics to track visits and the popularity of articles. Similar to Outbrain, to customize your widgets’ look and feel, it has to be done via theme files. This may be a challenge for some users. Lastly, there’s no option to remove any recommended links you may find unsuitable for your website. Here’s a tabulated summary of my findings to help you decide on which service to use. Prefer WordPress plugins better? No problem. Here are some of the favorites when it comes to displaying related content and links.